. : Optics & Photonics Focus :: Asking Twice, Yet Knowing Nothing :. Weak quantum questions. The researchers verified that a series of two weak quantum measuments can lead to restore the original state. The second measurement effectively undoes the effect of the first one. The picture shows the heart of the setup, where the qubits were generated and handled. Picture: Erik Lucero, Martinis Group. Will you marry me? — Our urge to know things often drives us to asking very important questions. In science, questions are asked by performing measurements, which provide us with valuable insights into the fundamental laws of nature. Recent experiments in quantum physics show that a paradoxal situation can be achieved: asking more may lead to knowing less. In John M. Martinis' lab (University of California at Santa Barbara, USA) and in close collaboration with the groups led by Andrew Cleland and Alexander N. Korotov the concept of weak measurement was experimentally realized opening the way towards subtle new effects of quantum mechanics. Just like there are different types of questions, there are different types of measurements. There are, for example, many different ways of asking someone to marry you; some are relaxed, others pushy, some are traditional and romantic, while others may be extravagant. All these styles may give a different edge to a question. Equivalently, there are very different types of measurement. For the sake of argument, let us focus on yes/no-type questions and, hence, on experiments with two possible outcomes: signal or no signal, that is, answer or no answer. Often we ask strong questions: decide now and tell me if you will marry me! A strong question must be answered immediately and conclusively: either yes or no. In quantum physics, a strong measurement causes the status of the system to collapse into a specific state. For example, if a photon passes through a polarizer, its polarization corresponds to that of the polarizer. If it does not pass, then its polarization is orthogonal to that of the polarizer. The photon must conclusively answer the questions: is your polarization that of the polarizer? In recent years, however, scientists have become more and more interested on weak questions: in case you are ready to take a decision right now, please tell me if you would like to marry me. Such question does not prompt for an answer and if there is no answer, all we know is that there was no positive decision taken. We might illustrate this setting with a damaged polarizer with holes, where photons can be polarized, or else not be affected at all by the damaged polarizer. This, again, leaves us with the same three possibilities: yes, no, and no decision taken. Of course, a null result does increase the probability of a negative answer. Imagine your great love is undecided before you ask the question and each time you ask, their indecision lies between to marry, not to marry, and have not decided in equal measure. Since the question was not answered, you know that they did not choose to marry and, hence, you are left with two options: either a no answer or a have not yet decided answer. If you were to ask the same question a second time, your odds would be worse than 33% since you already know that they have not chosen to marry. Your only chance would be to hope that, this time, the answer would be not decided and that they would, at the moment, change from not decided to to marry. So asking the same question twice will not in itself restore the initial condition of having equal probabilities for all three possibilities. So how could you restore the initial condition of having equal probabilities after a first null result? By asking the opposite question: the second time, you can say please say yes, if you wish to decide right now not to marry me. This time, not getting an answer means that they did not choose not to marry. From the first question you therefore know that they did not choose marry, and not answering the second question tells you that they did not choose not to marry either. In fact, if you are very courageous, you may well try to play the whole game again; but if you intend to get married, be careful: getting two null results is not something you will get each time you ask; and after getting a first null result, the probability for getting a not to marry is higher than the probability of getting to marry! Nonetheless, not enforcing an answer and picking your second weak question in this way will lead to the deleting of the information acquired through the first question. Schematic representation of a weak measurement. The particle is trapped in a potential (black) and can be in any superposition of the two states (red and blue). 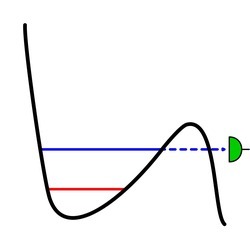 From the blue state, there is a probability to tunnel (dashed blue) out of the potential and being measured by the detector (green). When it comes to experiments, consecutive measurements take the role of asking questions. "In our experiment," Nadav Katz explains, "we were able to show this mechanism of erasing such quantum information through two consecutive null results." Katz, now assistant professor at the Hebrew University of Jerusalem in Israel, has worked on the experiment as a postdoc at UC Santa Barbara. 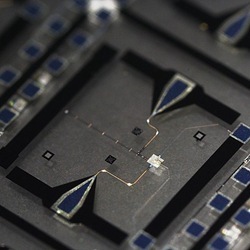 "We used superconducting phase qubits and weakly measured state 1, meaning that we measured whether the qubit collapses into state 1 without forcing it to decide. Then, we used a pi-pulse to exchange the two states and measured state 1 again. Globally, we therefore performed a weak measurement on both possibilities, state 1 and the inverse of state 1: state 0. In order to verify that we are really back to our input state, we performed full state tomography on our qubits that exactly determines what state they end up in. What we were able to conclude experimentally was that our process, indeed, brought us back to the input state if we measured two null results. In other words, the second measurement, in the case of yet a second null measurement, had restored the initial state and therefore, the second measurement did, in fact, undo the effect of the first measurement." "I think this experiment is undoubtedly a breakthrough, and believe that it will be seen as a landmark paper," Andrew Jordan  from the University of Rochester says. As a specialist on weak measurements, he points out that many textbooks describe measurements in quantum mechanics as instantaneous and inherently irreversible. "We now know that wavefunction collapse is neither, and that these properties only emerge as a special case." Apart from its importance for fundamental research, both Katz and Jordan see a lot of potential for future applications. "Everyone always talks about quantum computers (and that is fine), but look at the progress that has been made in quantum communication and cryptography," Jordan points out. He is convinced that in the next 10-25 years, "these aspects will make the largest impacts on technology." Katz agrees but focuses rather on advancing experimental capabilities. "Ultimately," he concludes, "the better we are able to control these systems, the more we can push the envelope, the more we can play with physics; and this is typically where the greatest ideas are born." A. N. Korotkov and A. N. Jordan, Undoing a Weak Quantum Measurement of a Solid-State Qubit, Phys. Rev. Lett. 97, 166805 (2006). Nadav Katz, Matthew Neeley, M. Ansmann, Radoslaw C. Bialczak, M. Hofheinz, Erik Lucero, A. O'Connell, H. Wang, A. N. Cleland, John M. Martinis, and Alexander N. Korotkov, Reversal of the Weak Measurement of a Quantum State in a Superconducting Phase Qubit, Physical Review Letters (2008) 101, 200401 (link).